I recently was lucky enough to pick up a good book off the book cart. Actually, this is the 2nd really good book I have grabbed. I think generally speaking the donated books we have to choose from are not so great, or at least not my taste. There are a lot of romance novels which aren’t for me. I have read a few westerns that were ok, and Twilight, which let me tell you, I didn’t like it. I think that book is written for women. The one other really good book I read so far while here is The Way of the Peaceful Warrior. I thought this book was awesome, and it made a big impact on me. 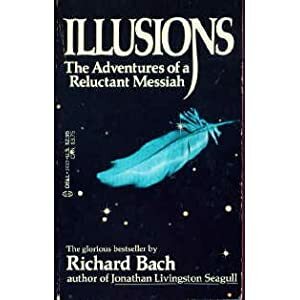 But anyway, I grabbed Illusions by Richard Bach. It’s a thin little book, and I really enjoyed it. I told my mom about reading it when he had our weekly call on the phone, and she told me it had been around since she was in high school, and she remembered reading it years ago. This made me think of myself. Sometimes in my life, I have gone against my impulses to do the right thing. I have chosen a different direction instead of trusting my god, or sky, to send me in the right direction through my impulses which are usually well intentioned. I find it strange that my whole life I’ve gone against everything I know to be right, knowing exactly where it will end up taking me in life. So, I guess in the end, I have acted on desire, and not really on gut impulses. Now that I sit here I remind myself I wanted to be here, obviously. We are all in our certain state of life because we chose it, and if we don’t like it, we just gotta work a little to get to where we wanna be. In closing for today I leave you with this final quote from Illusions. If you haven’t read the book, or did years ago and don’t recall it so well, I suggest you give it another read. It’s a short book but has a good message. Hey Magnum… that’s a FANTASTIC book…. i so loveit… It has the most awesome lines in there…. Just wanna say that i’m so glad to hear that you are a recoveribg addict. I’m a recovering addict myself…. been clean since 1985 now… and I pray to God that I stay clean for the rest of my life. Just wanted to tell Kathy that she touched me with the most beautiful commet i have ever read anywhere…. God Bless you Kathy…. OK, Magnum, you take care, and may God always be with you to guide you and guard you…. Hey Neil, thanks for the note. Great to hear you are a recovering addict with so much clean time under your belt, that is fantastic. I have been away from the blog for awhile, now that I am out with real life stuff going on. Some days are better than others but overall life is great, I got married and now am a father too! Working hard and keeping my head above water. I have just 7 more months till I am clear of parole too. Life is good if we let it be. Thanks again Neil for reaching out, and you take care and keep doing great like you are. Peace. I like your last post a lot. You picked some great quotes there. We often go with desires instead of right minded thoughts. Not all desires lead us to a bad places, we just have to choose which ones to follow. You are a smart guy that made dumb mistakes. I say “made”, because you have the power to keep it in made, not “makes”. You have to make staying clean number one and good stuff will follow. Just never put anything at all in front of that. Prison is next for you and days will go by whether you want them to or not. There is the other side to all of this and you will get there. Hang in there pal, you will be just fine. This is actually a reply for the latest thread “A very real feeling”. For some reason I didnt see the reply link, so Im replying here. Your post brought back some very real feelings for me too. For me it was when my son was going thru what you are going thru right now. This was about a year and a half ago. Every new step of the way was nervewracking. You are right, its the fear of the unknown. He got along ok in county, so I hoped it would be the same when he transferred, and it was. He has had his ups and downs as we all have in this journey, but we adapt, and you will too. By the time he left for TDCJ he was tired and ready to go, just like you. I will tell you this. I have heard from others that TDCJ is easier than county. I didnt believe it and didnt see how. They were right. My son has explained that theres more to do to occupy the time, so the time goes faster. The commissary is better and theres rec time to actually sit outside, or do what you want, but just to actually be out there. Take a job. He asked for an outside job and was put pulling weeds, mowing, weedeating, etc. Fresh air and getting away was the key. Take whatever classes they offer. No matter if its landscaping, bible study, whatever, take it. Again, the change of scenery and keeping your mind and body occupied is key. Dont get caught up in any drama. Do your own time and nobody elses. Write often. Read often. You will be fine, youre a smart person. When you go for intake they may try to psychologically test you. See if they can make you mad. Keep in mind its a game. Dont let them win. It has to do with how they will classify you. If you show no anger it will go a long way. When they ask you why you are there, be truthful and take responsibility. Im sure none of this is new to you. Im sure you have gotten more advice than you need, but I wouldnt be a mom if I didnt try to reinforce it. If your charges are not aggravated, you will begin recieving time credits which will go toward your time inside. Keep your nose clean and dont do anything that will get any good time taken away. It will go by faster than you think it will. You will do fine. You will be ok. This will be a new journey and you will make it. Hang in there! Think of everything as another blog entry…also, you can ask for indigent supplies when you get there and they will give you basic supplies to be able to write home, until you get commissary. Take Care. Be careful. Hey a question… Do they charge for laundry or is it free? And if they charge how is one to pay for it if you can not work?